Of the many joys of living in Tower Hamlets, one of the greatest is discovering and appreciating its historic gems. Take the ancient Church of St Dunstan and All Saints in Stepney, for example. In short, the East End and its elected councillors should be proud of St Dunstan’s and be doing everything possible to preserve its place in our borough. After all, history is vital to our shared identity. Which is why it’s a little surprising that amid all the fuss being made about the proposed dropping of two relatively artificial ward names (‘Lansbury’ from the East India and Lansbury ward and ‘Banglatown’ from Spitalfields and Banglatown), hardly a word has been said about the potential loss of ‘St Dunstan’s’ in the new Stepney wards. If the recommendations from the Local Government Boundary Commission for England are accepted after the current consultation period ends on January 7, possibly the most famous parish name in the country will be removed from the electoral map. Instead, the current St Dunstan’s and Stepney Green ward will, with the additions of various parts of Mile End and Globe Town and Whitechapel, become Stepney West and Stepney East. This is Labour’s fault and I’m hoping it was an unintended consequence of trying to resolve a fairly complicated problem about changing population numbers. Whereas Mayor Lutfur Rahman, very much to his credit, and the Tories both recommended keeping St Dunstan’s, Labour wanted to create new wards to accommodate the vast Ocean Estate. 77. A new Stepney West ward takes in part of the existing Whitechapel ward east of Sidney Street and an area from south of the A13, currently in Shadwell ward. Its southern boundary is Cable Street. The eastern boundary follows Butcher Row to the Commercial Road and then turns up Bromley Street and a short section of Stepney High Street to Ben Johnson Road. The northern boundary to the ward follows Stepney Green and then goes along Redman’s Road and north to Mile End Road. 78. This area is recognised as Stepney by local residents. It includes Stepney Green Park and the Sir John Cass’s Foundation and Red Coat School. It incorporates major housing estates including the Sidney estate and Clichy estate. 79. With two councillors, the ward would have three per cent more than the average electors per councillor in 2018. 80. A new Stepney East ward’s eastern edge is clearly defined by the strong border provided by the Regents Canal and Mile End Park. The northern boundary is the Mile End Road. The southern boundary follows that described above for the northern boundary for Stepney West ward. It then goes south down Bromley Street as far as southern edge of the park around St Dunstan and All Saints church and down White Horse Road as far as Salmon Lane. The boundary then follows Salmon Lane to the Regents Canal. 81. The new ward incorporates the Ocean estate in its entirety, an estate which is currently divided between Mile End and Globe Town ward – polling district MGT4 – and St Dunstan’s and Stepney Green ward. The estate has a very strong identity which was reflected in it being selected as a New Deal for Communities area under the last government. The estate has a strong residents association. It has a doctor’s surgery which is being refurbished and a children’s centre. The estate as a whole represents a catchment area for both of these facilities. Stepney Green secondary school is used by children from the estate and the shopping parades on White Horse Road and Ben Johnson Road, currently in different wards, are also used by residents from across the estate. The ward also includes the Limehouse Fields estate which is south of Ben Johnson Road. 82. With two councillors, the ward would have one per cent less than the average electors per councillor in 2018. The area covered by the current St Dunstan’s and Stepney Green ward constitutes a real community, bounded by Mile End Road to the north, Commercial Road to the south, and the Regents Canal to the east. 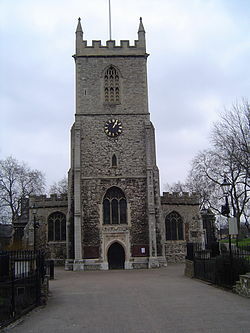 Notable local landmarks that form part of the contemporary community identity include the Stepney Green conservation area, St Dunstan’s Church (founded in 923) and the Stepney City Farm. However, the southernmost part of the current Mile End & Globe Town ward is also part of the St Dunstan’s/Stepney area. Just as nowhere north of Mile End Road or south of Commercial Road could be considered to be Stepney, this area in between these two unarguable boundaries is universally held to be part of Stepney. Indeed, prior to the last review, polling district MGT4 fell within the St Dunstan’s ward, and rightly so: residents in the area consider themselves to live in Stepney or St Dunstan’s, not Mile End. This polling district is dominated by the Ocean Estate, part of Stepney. The two communities are divided by a major road, the A11, the integrity of which is preserved as a boundary between all other wards which fall on either side of this road. It seems nonsensical for Mile End & Globe Town ward alone to stretch over the A11 to include this part of Stepney. Accordingly, I propose to include all of polling district MGT4 in the new St Dunstan’s and Stepney Green ward. When this polling district included, the numbers are ideal for a three-member ward. 77 The Labour Group proposed a two-member Stepney West ward and a two- member Stepney East ward. These wards were proposed to have an east–west orientation and were split along Bromley Street and Redman’s Road, uniting the properties along Stepney Green in the Stepney East ward. The Group argued that these arrangements maintained estates within the same ward and incorporated an area ‘recognised as Stepney by the local residents’. The Labour Group proposed that the southern boundary of its Stepney West ward should extend south of Commercial Road to Cable Street. However, the southern boundary of the Labour Group’s proposed Stepney East ward did not extend as far south as Commercial Road. Instead, the boundary proposed by the Group would follow the minor road of Salmon Lane. 1478 The Mayor and Conservative Group both proposed north–south arrangements which used Commercial Road as a southern boundary and split the Stepney area vertically. The Mayor proposed a boundary along Jubilee Street. The Conservative Group proposed that the boundary should use West Arbour Street. The Conservative Group argued that, although its boundary did ‘not follow any major road or dominant physical feature, this is the case at the moment also, and the proposed boundary does not divide any estates’. The Conservative Group argued that the current ward boundary along Jubilee Street – which was proposed by the Mayor – divided the Clichy estate. The Mayor did not provide any community evidence in support of his proposed boundary along Jubilee Street. 79 Having walked the area, we are of the view that the diverse estates and housing in Stepney are linked by Stepney Way, which runs east–west in the area. We are of the view that neither the Mayor nor the Conservative Group provided for strong boundaries in their submissions. We are further of the view that the Mayor’s proposal split a cohesive estate along Jubilee Street. 80 We therefore consider that the arrangement proposed by the Labour Group provides for strong east and west boundaries and keeps communities together within the Stepney area. However, we were concerned that the Group’s proposed southern boundary of Stepney West crossed the busy Commercial Road. To provide for both clear boundaries and reflect local communities, we therefore propose that the southern boundary for the Stepney West ward should run along Commercial Road. As a result of the recommendations for Limehouse (paragraph 57), we also recommend that the southern boundary for Stepney East should be Commercial Road. 81 As a result of these modifications, an electoral imbalance of -22% would result in the Stepney West ward. We therefore propose two further modifications to ensure improved levels of electoral equality in the ward. 82 Firstly, we propose that the north-east boundary of the Stepney West ward be extended to run along the backs of the properties on the east side of Stepney Green. This ensures that the houses along Stepney Green are not divided between wards. To the east, we propose to extend the ward’s eastern boundary to Belgrave Street, a road with housing consistent with much of the housing in Stepney West. For the remainder of Stepney West and Stepney East, we have decided to adopt the Labour Group submission without modification. As a result of our recommendation, the wards of Stepney East and Stepney West would have 5% fewer and 7% fewer electors than the borough average by 2018, respectively. I’m hoping that the likes of Mayor Lutfur and the three current ward councillors, Independent Oli Rahman, and Labour’s Abdal Ullah and Judith Gardner (who spoke passionately about the need to preserve the borough’s heritage during a debate on the sale of Henry Moore’s Old Flo at last Wednesday’s council meeting), will now voice their concerns about this apparent oversight. Of course, the work of St Dunstan’s and All Saints’ Church will continue regardless, but if we’re quite rightly (in my view) campaigning to preserve Banglatown on the political map for heritage reasons, then surely we need to be consistent with a name that has a much longer history. I’m not sure what the solution is, but what about the wards being called Stepney West, and Stepney East & St Dunstan’s? Perhaps we need to start a petition for this. In the meantime, people can also protest to the Boundary Commission via this address: reviews@lgbce.org.uk . Oliur Rahman, an Independent ward councillor for the area and a member of Mayor Lutfur’s cabinet, is backing the retention of the St Dunstan’s name. He told me on Twitter earlier that he would support a Stepney East & St Dunstan’s name. I’ve posed the same question to the mayor and will be doing likewise with Labour councillors. Um, I wonder if you knew how historic ‘St Dunstans’ is as a ward name. Because the answer is “not very”. It was first used in Stepney Metropolitan Borough in 1959. Why must St Dunstan’s be preserved when some other historic parishes, which do go back a lot further, are not used for ward names? I would certainly say St George in the East has a greater history than St Dunstan, but that’s not been used in ward names since 1964. What about St Mary Spital, which was the base for the ward name St Mary’s up to 2002? I think that would work. The revised Shadwell ward which has St George’s church in it could be called St George’s in the East, while the new Whitechapel ward could be called St Mary’s (by the way, it’s named after St Mary Matfelon not St Mary Spital). I hope you’ll be writing to the Commission to suggest these names. St dunstan’s name should stay. Giving the historical church. Same as banglatown should stay, we have long history as well. We will be here till the end. We are busy populating. Yes the long and noble history of Banglatown ever since 1998…truly epic. Political parties are the wrong people to determine these sort of things because they don’t have the interests of the people at heart they are only looking towards their own electoral advancement. So we nearly had “Shahjalal” (meaning what?/where?) for Stepney and are having Banglatown IMPOSED by a minority on the majority in Spitalfields who either (a) don’t care, or (b) don’t know, or (c) hate it with a passion. In France the electoral districts/etc are set in stone in the constitution and have not been changed since 1792. Now there’s a thought. The original intention in Labour’s submission was to rename it Stepney East & Shahjalal. This was approved by a majority of Labour Group but voted down by a majority of the local party members, after fulsome debate. There wasn’t any ‘fulsome debate’ delegates/cllrs were bounced into making a snap decision. They were also perfectly happy to remove the name St Katharine’s. Its a bit hypocritical of Cllr Abdal to now suddenly come out of the woodwork in support of keeping the name St.Dunstans, because as oldford1 states above “The original intention in Labour’s submission was to rename it Stepney East & Shahjalal.” The idea behind that name was suggested by none other than Cllr Abdal. A hypocrite and two faced limelight seeking glory hunter is what this Cllr is about. JF we are not in France. You seem like someone who is really frustrated by the Bangladeshi people living around you, considering you held so called high positions in the borough as a vice chair of Spitalfields and BanglaTown for 2 months,and as a journalist for the East London paper. Amazing. Stop attacking the Bangladeshi community at every opportunity you get, if you don’t like living in Banglatown, hop it somewhere else. The people you claim to be from the Old Spitalfields, have moved in here a few years ago, have no interest in the development of the community, do not vote in elections, thus Lutfur and Robbani get in, and are at wholesome only interested in the value of their property and how life can be easy for them, only complain when they need to. The Name Spitalfields also is not yours, stop trying to protect this as if you own it,and the Bangladeshi community who have lived their for decades have done nothing to preserve it. The local community in Spitalfields are proud to live in spitalfields and BanglaTown. BanglaTown is a symbolic name and was a gesture of good will. The Bangladeshi community are more likely to call ourselves living in Bricklane or Spitalfields. you my friend are a closet, actually open Racist,and its disgusting that you are allowed to air your views in such way. I chose to stand up for my local community and how most of them feel about this naming issue and now the slander and threats have begun. It is sad but not entirely unpredictable. Therefore the first issue I have to confront in your rambling cacography is the inappropriate, defamatory and insulting use of the word “racist”. I know I am not the first person to be tarred with this grotesque label for daring to challenge bias and unfairness in this borough – I know Ted has been too – but it is all the more depressing when it comes from a senior member of the local Spitalfields Labour Party. The word “racist” is used far too often by those who either do not understand what the word actually means or those who do but have decided to cheapen and demean it by using it as a slur calculated to intimidate and isolate anyone with whom they are incapable of debating coherently. So, being generous and assuming you mean the former, it is necessary to remind everyone what the word “racist” actually means. As a noun (e.g. “a racist”) the correct definition for the word is, “a person with a prejudiced belief that one race is superior to others” or, “a person who believes that race accounts for differences in human character or ability” and more generally and more recently, “a person who has hatred without reason for another race”. These are the correct definitions of the term “racist” and accordingly I can say to you now quite categorically that I could never be described as “a racist”. I do not believe that English people are superior to Bengali people or any people for that matter. I believe in a brotherhood of man, I believe in fairness, equality and respect. It is perhaps a cliché but it is also necessary for me to say that many of my closest friends are of a different “race” to me and it is abundantly clear to them that I do not hate them. Nevertheless, I think yours is an example of how the word “racist” is maliciously over-used and misused by people who associate with the far-left but behave like the far right. People like you employ the ‘R-bomb’ whenever you want to terminate or distort a debate that concerns any aspect of culture or identity with someone who is usually white and with whom you disagree. This is sad because it shows a lack of intellectual rigour but worse than that it demeans and debases the true meaning of that word and as such it is an insult to the real victims of racism the world over. I must ask you – does not a version of that sound familiar? Can you not see the irony? Is it not sad how frequently in these instances, to be metaphorical, the abused child so often becomes the abuser? Before the insult you castigate me for having the audacity to speak up for the non ethnic-Bengali people of Spitalfields. I know a great many people who live in Spitalfields who are not Bengali and to a man they say how marginalised, isolated and ignored they are by local councillors in Spitalfields who time and again have indicated to them a complete lack of empathy, concern or interest. They are very fed up with it. However, unlike them, I will go further because you brought up the Spitalfields Labour Party. If that is not generalising, stigmatising and denigrating a whole community then I do not know what is and you have just revealed in one clumsy sentence why nobody from the non-Bengali community should ever vote for Labour in Spitalfields ever again. They should put those words from Tower Hamlets Labour up on a big poster because your opinion just about said it all and in case anybody missed the point: the Labour Party in Tower Hamlets institutionally discriminates against non-Bengalis and seeks to exclude them from positions of power in this borough. Well, there is still one dwarf left in Moria. As a former insider I can reveal that the Tower Hamlets Labour Party is an ideologically vacuous organisation that has no values, achieves nothing and serves only as a vehicle for the personal aggrandisement and enrichment of those closely involved within it. It is a bigoted and divisive organisation which (until recently) successfully played Russian-roulette with the politics of religion and nationality in order to get elected, get power and oversee the systematic redistribution of tax-payers cash along ethnic lines. It is my view that the party deliberately and institutionally discriminates against everyone who is not Bengali. Typically, branch meetings are held in Bengali, secret meetings are held outside official meetings (which non-Bengali members are never made aware of) and no attempt whatsoever is ever made to make the party genuinely inclusive or diverse – indeed the opposite. Nothing is ever pursued that does not sugar narrow, patriarchal, “village-politics” interests. I will continue. When a member I quickly discovered how THLP was an organisation without merit whose only consistent ambition was power. Tower Hamlets has two reasonably good MPs but they are both undermined and resented amongst the rank and file; one because she is an “immoral woman” and the other because he is British. For the most part the local party has completely lost touch with the people it was meant to represent and has become so riddled with corruption that it will stay under ‘Special Measures’ until kingdom come. It was also pointed out to me that within this tarnished oligarchy there had not been a discussion about party policy within living memory and despite all the pretences most decisions are made exclusively by Bengali men at secret meetings. It was only at the highest levels of the constituency party that you ever saw any women and apart from a few dropped-in automatons were usually the wives and daughters of local grandees bussed-in for one night only so they could symbolically stand for reserved women-only positions in elections the results of which have already been decided. It is sad but true that long ago the Tower Hamlets Labour Party decided to abandon the working people of the East End because they were unreliable, interested in quality and not easily pleased. It plumped instead to court the votes of only one section of the community and successfully tarred anyone who criticised this new state of affairs as a “Tory” or a “racist” (usually both). Since then the THLP has sank to become an institution whose only interest is the securing of a majority of Bengali votes which is an attitude revealed quite succinctly in Our Next Labour Candidate’s little speech and this is why the turn out in this borough amongst “the whites” is usually so low. Obviously Labour has not accepted (which is why they will continue losing) the reason why men like Lutfur and Gullam are stealing the honey they feel so entitled to and despite what they say it is not the fault of the nasty white folk which my critic caricatured in his bigoted and ignorant diatribe. The real reason for Labour’s continued failure is the spiritual collapse of the Tower Hamlets Labour Party. It is very sad that the Labour Party in the East End which was once so commendable has been torn apart by the petty rivalries of grubby crooks. As things stand they don’t deserve a single vote and outside of General Elections, TH Labour on its own merits has not won an election in Spitalfields for a decade and it is little wonder. I would ask people to put all this in perspective. Whilst I have tried to calmly explain the value of a neutral name which implies no favour some politicians amongst the ethnic-Bengali community in Tower Hamlets have reacted in the most appallingly divisive and provocative ways possible. The man who calls himself “our” Mayor hysterically declares it an “attack” on Bangladeshis “across the world” and threatens to challenge any decision in the court using rate-payers money. That means our public money whether we agree with his position or not. Whilst he plays pantomime on Channel 9 the local Labour Party becomes anxious not to lose out on the nationalist vote and spurts various lies before organising divisive and intimidating demonstrations of their own where people use words and phrases such as “war” and “fight to the death”. My opposition to parts of London (or anywhere else for that matter) being renamed after dominant ethnic groups is driven by liberal principles and broadly supported by people in Spitalfields. I have put my head above the parapet and attempted to outline why I think the ethno label of “Banglatown” is both wrong and unnecessary. Nevertheless, my Labour Party accuser has lowered himself to the level of slander, caricature and mud-slinging and no doubt now will resort to threats and intimidation. This man wants to represent Spitalfields for the Labour Party and I suspect he may now have blown his chances but what do Spitalfields votes count for anyway, especially if the new super-ward gets the go ahead? Nevertheless, if he was elected he would fit in very well with the rest of them. I am allowed to air my views because despite what you would like this is still a free country. May Labour rot at the next local elections. How about Stepney East -> St Dunstan’s ward and Stepney West -> Redcoat ward? These are the historic names. The last full council meeting. And my first. It was akin to some kind of 60’s sitcom and very sad that this represented local democracy. By mistake it seems I found myself sitting alongside the” pro Rahman supporters”, who would cheer the independents on cue, and jeer other elected members at points in an manner I felt as being intimating. What was strange was how the mayor was positioned up above his councillors alongside the chair, behind his lectern, texting and possibly sending down instructions to the “independent” councillors below him. Like some grand puppeteer. Except for a few (perhaps 2) notable members of his cabinet, the rest presented as wholly unconvincing while reading pre prepared responses or howling like slighted children in a school playground. What struck me was the Mayor’s lack of passion for local politics; apart from reading his pre-prepared speech (standing up and reading out loud) he never once stood up and argued a point – it felt that he sat in contempt of this process of local democracy, either unwilling or unable to be an effective orator or defender of his political position. A very week show indeed. If the Prime minster can stand up from amongst his party and argue a case why can’t Rahman? Can you imagine the PM sitting up beside the speaker in parliament, refusing to answer questions and looking down upon the commons with disregard? Although not a natural supporter of conservative policy, the leader of the conservative group surely must earn respect for his challenge and bravery within the chamber. Is it the case that at least one independent councillor is not resident in Tower Hamlets “the member for Ilford”. The Labour group presented as being well organised and mature when compared to the independents, one councillor suggesting that the names “Spitalfields and Banglatown” complement each other in a well-balanced and thought out response. From this sad show, I would hope that the conduct of most of the independents and their supporters around me is a politics that must be consigned to the past. If Rahman wins the next election he will surly become more isolated and less influential outside of his small powerbase here in Tower Hamlets. Labour Party – stick to your position and help pull Tower Hamlets politics away from the self-interest of the few! while the leader of the conservative group please keep up your fight! I believe that true democracy will eject Rahman and his backers into a disregarded footnote of a sad time for Tower Hamlets Politics in the history books. Perhaps Rahman’s best form of defence is silence. if he starts becoming publicly accountable he will find himself having to answer difficult questions about how he is spending our money. The name St Dunstan’s should not be dropped, nor should Banglatown. Nor Lansbury. Why are (some) people so keen to eradicate local heritage? The window at St Dunstan’s (and thank you for this information, Ted) commemorates recent history at Stepney, where a plan for housing was initiated after the streets were decimated by wartime bombs; the LCC’s first purchase via the Arts Council for one of the new estates, was Henry Moore’s Draped, Seated Woman (‘Old Flo’). This was site-specific public art and heritage that has a profound meaning and connection to Stepney. If we start to take away the name, then next it’s the tangible heritage – the buildings, the streets, the art works. It feels like heritage cleansing – as if by expunging the provenance we can then demolish, destroy, sell off. The same is happening with Banglatown. Get rid of the name, demolish Spitalfields’ London Fruit and Wool Exchange and WW2 Mickey’s Shelter (and two more 1920’s buildings and a 17th c. street) and make sure ICAP plc build and obliterate local heritage. The name ‘Banglatown’ may be a recent one but most residents who have lived here long enough – or care enough – know that there is a long and shared heritage that goes back here, and across the borough, to the 1600’s at least. Perhaps those that want to change boundaries and names, should get themselves to Bancroft Library. Get a copy of Cockney Campaign (1944) by the then Mayor of Stepney. Then try continuing this eradication of Stepney’s history. Let’s respect and keep what we have have. From Bancroft Library to Mother Levy’s Jewish Maternity Home, to ‘Old Flo’ to the London Fruit and Wool Exchange and Mickey’s Shelter…there’s so little heritage left and it seems just a handful of people who are set on demolishing it, exploiting it, selling it, or changing it. Thank you Ted for highlighting this issue and hope that you do not mind helping further with this last-minute appeal. Also, of course, the contact details are there for residents who wish to object to the other proposed changes.